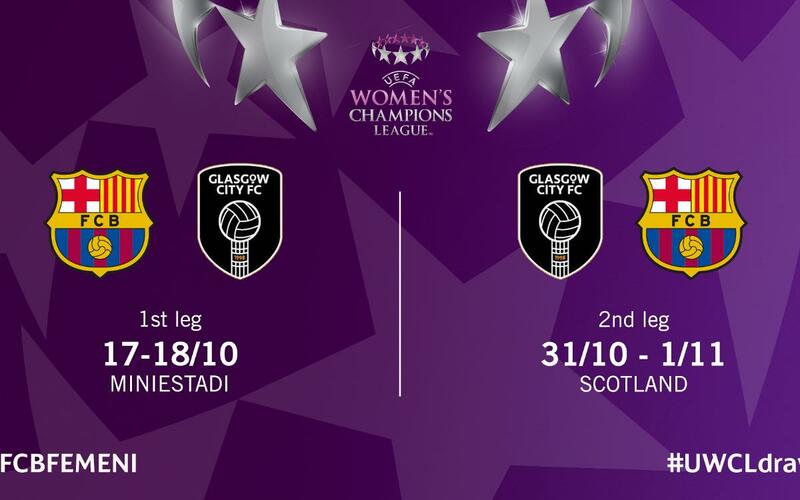 Barça Women’s next rivals in the Champions League Round of 16 are Glasgow City FC. The draw, held this Monday at midday in Nyon (Switzerland) decreed that the first leg will be played at the Miniestadi on October 17 or 18 and the return, in Scotland, on October 31 or November 1. The Blaugrana were the fourth seeds in the draw thanks to their good European form in recent seasons, which meant that they could only play against one of the teams with the lowest coefficient. Glasgow City are the best team in Scotland, where they’ve won eleven league titles. A physically powerful squad, with many players in the national team that have already qualified for the 2019 World Cup, they knocked out Somatio Barcelona (Cyprus) in the last round 2-1. “They’re a team with highly experienced players, who are great defensively and are in good shape both for the first leg and for their national team. "I would stress that the game in Glasgow will be very hard, because they will feel at home and show their strength and passion. We have to do a good job at home ourselves. "We don’t underestimate any rival, more so after what we experienced in the tie with BIIK. That experience helped us learn more as a team."